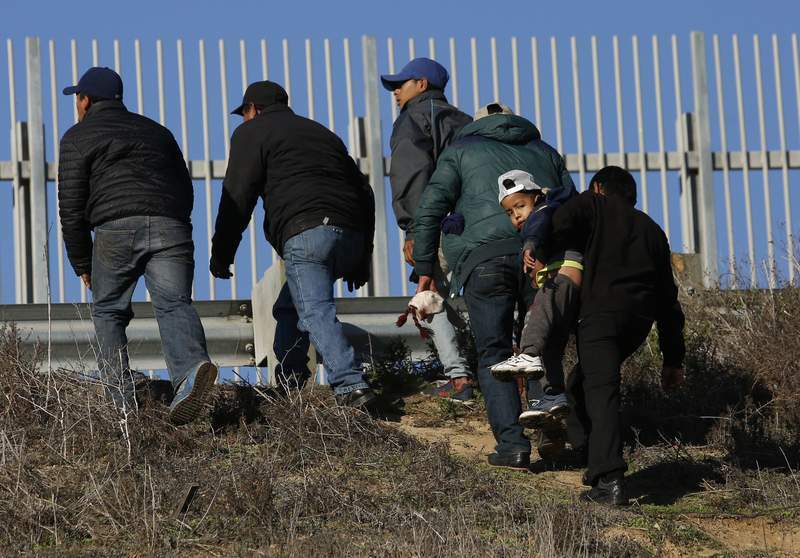 Associated Press Honduran migrants, who plan to turn themselves over to U.S. Border Patrol agents, walk up the embankment after climbing over the U.S. border wall in Tijuana, Mexico, Wednesday. The group crossed to apply for asylum. WASHINGTON – President Donald Trump pledged Thursday to do “whatever it takes to get border security,” deepening an impasse over border wall funding barely a week from a crucial deadline for a partial government shutdown to begin. In a video posted on Twitter, Trump attacked Democrats as “absolute hypocrites” and claimed they've supported funding border barriers in the past but won't do so now because of their opposition to him. The video showed images of people rushing the border and included clips of Senate Minority Leader Chuck Schumer, D-N.Y., former Secretary of State Hillary Clinton and former President Barack Obama speaking in opposition to illegal immigration and in favor of border security. The video came two days after Trump declared during an Oval Office meeting with Schumer and House Minority Leader Nancy Pelosi, D-Calif., that he'd be proud to shut down the government to get the wall money he wants. Since then, Democrats have attacked him relentlessly on the issue, with Schumer repeatedly accusing the president of throwing a “temper tantrum” as he threatens to lead the government into a partial shutdown in pursuit of a costly and unnecessary wall. Trump is demanding $5 billion for his border wall for 2019, while Democrats are unwilling to give him more than $1.3 billion for border fencing. Democrats said Thursday that they won't budge. Funding for federal agencies including the Homeland Security Department that funds the wall runs out Dec. 21 at midnight, unless Congress passes a spending bill before then and Trump signs it. Other agencies affected include the Justice, Interior and Agriculture departments, totaling 25 percent of government spending that is controlled by Congress. Other major agencies, including the Pentagon, have already been funded through September. On Capitol Hill, confusion and uncertainty reigns about how the dispute will end. Lawmakers headed home for a long weekend Thursday no closer to a solution, leading one key lawmaker to suggest that Congress might have to fall back on passing another short-term spending bill, kicking the can down the road once again because of an inability to compromise. The Homeland Security Department and other agencies are already operating under a two-week short-term spending bill. Senate Appropriations Chairman Richard Shelby, R-Ala., suggested Congress might have to extend funding until Dec. 26, or until Jan. 3 – right before a new Congress is sworn in and Democrats take control of the House. Shelby said other options could include short-term extensions until later in January, February or May, or all the way through the end of the fiscal year Sept. 30, which is the solution Democrats have proposed. “We're at an impasse,” Shelby said. “Something's going to happen, or we're going to have a CR or a shutdown.” A CR is a continuing resolution that extends government spending at existing levels. However, Democrats said no one had discussed the shorter-term options with them. House members are not scheduled to return to the Capitol until Wednesday evening, two days before the shutdown deadline, prompting sniping from some senators. Trump also claimed in an earlier tweet Thursday that “money we save” from a new trade deal with Mexico and Canada would make good on his long-standing promise to have Mexico pay for the wall – an assertion backed by no verifiable evidence. Schumer and Pelosi both ridiculed Trump for his claim.